It’s easy to forget sometimes as you turn on your faucet to cook or take a shower that water is a priceless resource that until recent history wasn’t readily available. When going back in time you can trace the history of agriculture, trade, and cities all to bodies of water, and this includes the epic Rhône River! The Rhône River begins at an alpine glacier in the Swiss Alps and then twists and turns its way through the cities of Geneva, Avignon, Lyon, and Arles. In Arles, the Rhône River is divided into two sections are nicknamed ‘The Grand Rhone’ and the ‘Petit Rhone,’ and flanking the river on both sides is the wine region of the Côtes du Rhône (or the Rhône Valley). The river eventually carries out into the warmer waters of the Mediterranean. The Rhône can be divided into the North and the Southern Valley, and the unifying force that brings them together is the mighty Rhône River. The Rhône has the most diverse soil of any region in France, and includes over 6,000 wine growing properties, including over 1,800 private wineries and more than a hundred winemaking cooperatives. The Northern Rhône is surrounded by oak forests as thick as the ones out of any Grimms’ Fairy Tales and orchards of peach and nut trees. Picture blustery winds and intensely cold winters and hot summers. This is the land of Syrah and white grapes (Marsanne, Roussane, and Viognier) that grow on granite and schist soil on steep cliffs. Less than one-tenth of total production from the Côtes du Rhône comes from the North but its silky Syrah and floral white wines are spectacular! If you go to the southern Rhône bring an array of wide-brimmed hats and tubes of sunscreen. It’s hot, the sun is dizzying and bright, but, hey, you’re in the Mediterranean, so go you! The south is the land of red blends; Grenache is the most popular grape grown here and you’ll frequently hear the term ‘GSM’, which stands for the common blend of Grenache, Syrah, and Mourvèdre. It’s also quite windy and vines are trained in low bush forms to protect the grapes. Here you have a vast array of wine styles, ranging from Tavel (mostly Grenache-based rosé) to the prestigious Châteauneuf-du-Pape, which boasts unique and large ‘pudding stones,’ or ‘galets,’ atop its vineyards’ soils. These large, smooth, oval-shaped rocks help with drainage for the vines and aid the ripening grapes by retaining daytime heat and releasing heat in the cool nights. One could drink only Côtes du Rhône wine for over a decade and still have more to discover through its 27 authorized grape varieties (list of reds and whites below). It’s a diverse, beautiful region, and thanks to the Rhône River the wines of this area thrive atop well-irrigated and prosperous land. 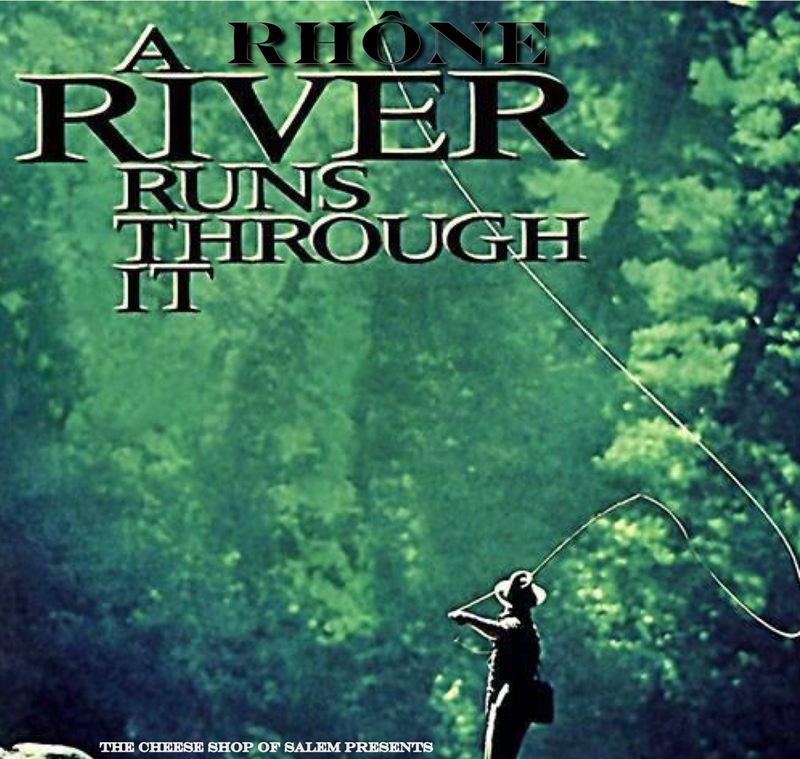 When drinking Rhône wine at Saturday’s tasting (or ever), don’t just thank the winemakers: send a big ‘Merci’ to the body of water that made trade and habitation in this region possible – the powerful, gushing Rhône River. 2015 Domaine Saladin ‘Paul’ (Northern Rhône, France) | The Saladin family has been winegrowing in Ardèche since 1422 – that’s a whopping 21 generations! Sisters Marie-Laurence and Elisabeth currently operate this biodynamic 18-hectare winery. This blend of Grenache and Clairette was handpicked and fermented using semi-carbonic maceration before its aging in tank for 9 months. It’s a smooth and earthy blend with bright notes of cranberry and juniper. 2015 Domaine Jean-Louis Chave St.-Joseph ‘Offerus’ (Northern Rhône, France) | If you see the words ‘St. Joseph’ on a bottle of French red you’re in for a treat – this appellation of the Northern Rhône signals two things: Syrah and depth. St. Joseph creates out of this world Syrah on its rocky hillsides, especially from the epic producer Jean-Louis Chave. 50% of this Syrah was destemmed before fermenting in tonneaux and stainless steel tanks and aged in barrique for 18 months. Chave’s signature is the texture of velvet, and alongside it’s smoothness, this Syrah boasts notes of boysenberries, black currents, and black pepper. NV DomaineRoche Buissière ‘Petit Jo’ (Southern Rhône, France) | Antoine and Laurence Joly purposefully harvest their grapes earlier than their neighbors in the Southern Rhône in order to bring a unique freshness to their natural wines. This blend of Grenache and Syrah was fermented for 15 days and then aged for 6-8 months in concrete tanks. It’s a lighthearted mouthful of wild cherries and raspberries. 2017 Guffens au Sud Roussanne (Southern Rhône, France) | Dutch winemaker Jean-Marie Guffens moved from Belgium to France in the mid-1970’s to explore his passion for winemaking. Now he runs three wineries that are all centered on different projects. His Roussanne, after vinification in stainless steel, is a great example of the wonderful white wine that the Rhône produces. It’s filled with youthful notes of pear, melon, and white blossoms. 2016 Julien Pilon Viognier (Northern Rhône, France) | After spending a decade learning winemaking in Spain and the Languedoc-Roussillon, Julien Pilon felt like he was ready to create his own label and settled in Isère in the North. His first vintage in 2010 was actually fermented and aged in his parent’s garage! Julien has come a long way since then and his wines, 80% of which are white, have been noted as being some of the most exciting Rhône whites in the market. This Viognierwent through malolactic fermentation before aging for 10 months in stainless. It’s an agile white with notes of white flowers and apricot. According to most updated version of The Wine Bible, there are 27 recognized grape varietals grown in the Rhône!